Disclaimer: This article might spoil your appetite. A couple of days ago, Burger King presented their Halloween-themed burger. Basically, it’s a whopper with A1 sauce and a black bun (that’s supposed to taste like they made it with A1?). This isn’t Burger King’s first time around the block. They sell black burgers year-round in Japan complete with black cheese and black sauce. In order to be up to date on food trends (yeah, even fast food), I had to try it. Ugh. It was the first thing I ate all day… and the last. Full disclosure: I don’t eat fast food often, so I don’t think my body was ready for this. Is there a way to prepare for a fast food fiasco? To keep a bad story short, it wasn’t good. The bun tasted like regular tasteless fast food bread, the meat was… meaty, the gooey A1 sauce was just that (gooey), and I should’ve asked for no onions. I had a stomach ache for the rest of the day, to say the least. I guess I don’t regret it because I would have just continued to be curious. Let me do you a favor — if you want to try it, just get a Whopper and pretend it has a black bun. That way you can avoid black specks in your teeth and your tongue turning blue (among other things, SORRY). 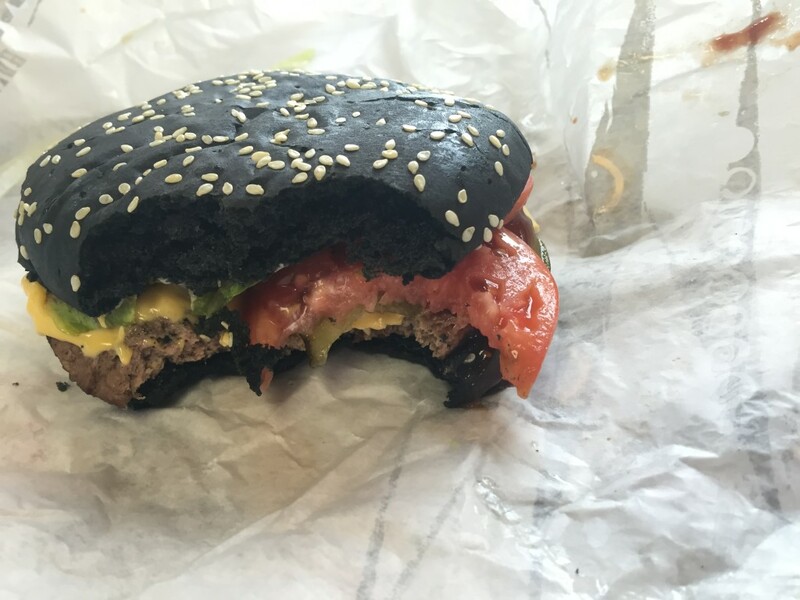 Japan uses natural ingredients in their black burger, and America should too.